Today happens to be my handsome hubby’s birthday. We took a vacation day so we could spend a three day weekend at the farm. July is a big birthday month for his family. His mom kicks us off at the beginning of the month. Luckily, this year we were at the farm earlier this month to celebrate with her too. We have a niece and nephew with a July birthday. Then his dad’s birthday hits and finally his! I’ve come to love farm birthdays. Now I love to throw a big party, and Lord knows the trio have had their fair share, but there’s something about birthdays with dirt smeared blue jeans and summer-hot-cheeks and homemade cakes served up with an ample scoop of ice cream. I love to bake. I don’t have nearly the time at home. But almost every time I’m at the farm I get to bake. Bake and write. Two of the best things ever. 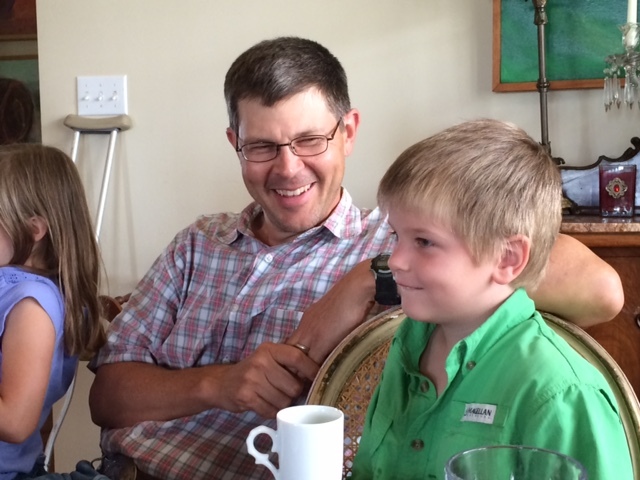 So after an easy lunch of sandwiches, chips and fruit, the whole crew, save two of the three five year olds, took naps in the heat of the day and woke to celebrate my father-in-law’s (belatedly) and husband’s birthday with coffee, cake and ice cream. I tried my hand at Tres Leches again because it is Bray’s favorite dessert and it really turned out. I had baked it in the morning while the crew were out fishing, Lord help us they caught an alligator (I may never adjust to the bayou), so it had plenty of time to chill. 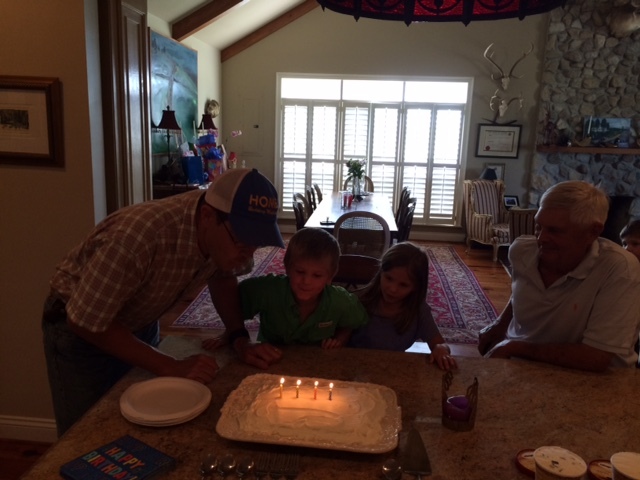 We lit four candles, to represent the last digit of his age, and sang happy birthday. After we cut big slices of the yummy goodness, we sat around the well worn table eating and talking while it was too hot to venture out. 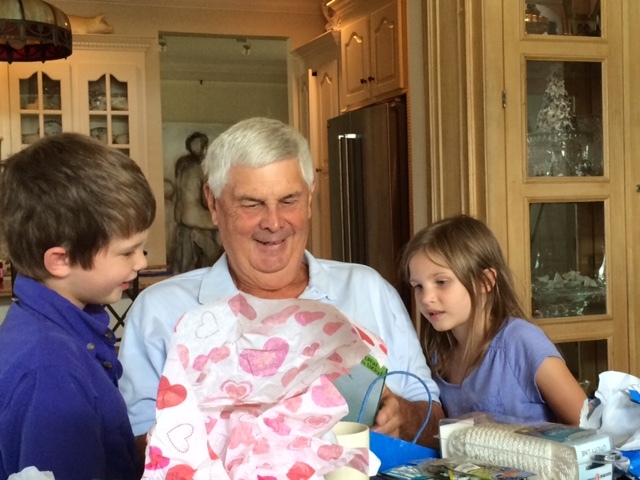 Grandpa opened his birthday presents, and daddy asked to wait until his birthday rolled around this morning to unwrap his (it killed the kids who LOVE to open daddy and mommy’s presents…). Talk turned to their various plans and while two ran to check on the peppers they’d picked earlier to use for supper, dad and grandpa and the eldest ran to town for boat supplies. I loaded dishes and then watched the beautiful summer storm roll in. This is a life I could never have envisioned. I had none of this growing up. My clothes were always pressed and my hair was always fixed. I read instead of catching frogs behind the shutters. I took piano lessons instead of baiting hooks and baling hay. It’s still stops me in my tracks: the space my kids have access to and the bravery they show working cows and holding a line with an alligator at the end. They dream bigger and plan fearlessly and adventure more because they see a big world and know the grandeur of God. They’ve still got a momma that screams when the frog jumps on her sandal and begs them to back further from the dock, but I’m learning and letting go a little more every time. 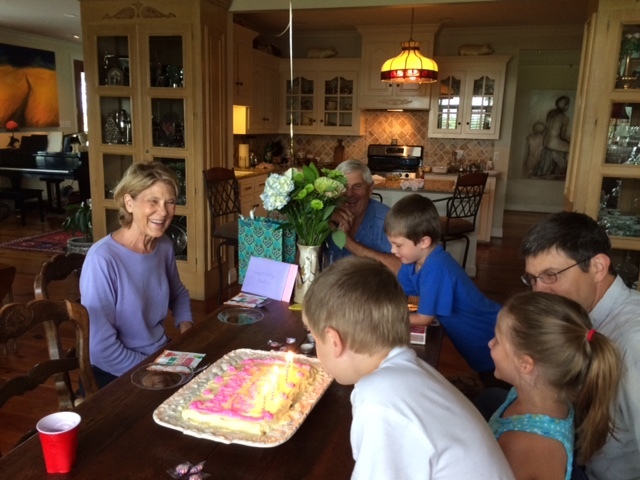 And I’m certainly embracing every moment of our stripped down birthday parties – the beauty of a handmade cake, the birthday song sung off key with gusto, and a celebration filled with those you hold most dear in life.